In Part 1, we discussed the principle and basics of the direct and converse progressed Moon in declination. 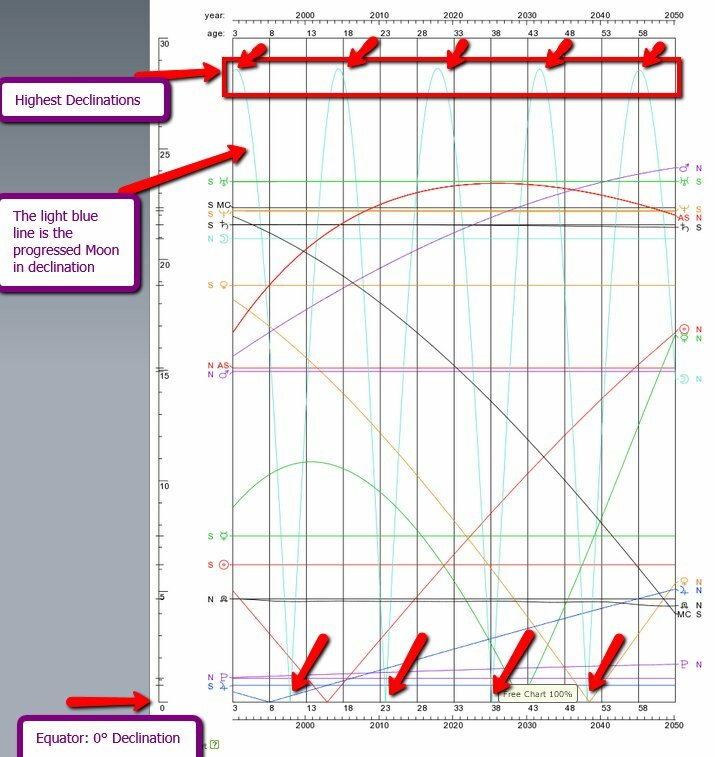 Some software programs (like Solar Fire) have a graph with the Equator (horizontal 0° line) in the middle and the North declinations above the 0° line, the declinations South below the 0° line. Look at the image below in which the 0° Equator line is in the middle, the North Declination above the line and the South Declination below the 0° line. Other software shows the 0° line (Equator) at the bottom of the Graphs and print the declination lines North or South above the horizontal Equator in different colors or lines of thickness. Look at the image below, it's from Astrodienst (see instructions below), showing the 0° Equator at the bottom of the Graph. Recently (early January 2014), Francois Hollande, the French president, admitted having an affair, resulting in the separation from his wife. 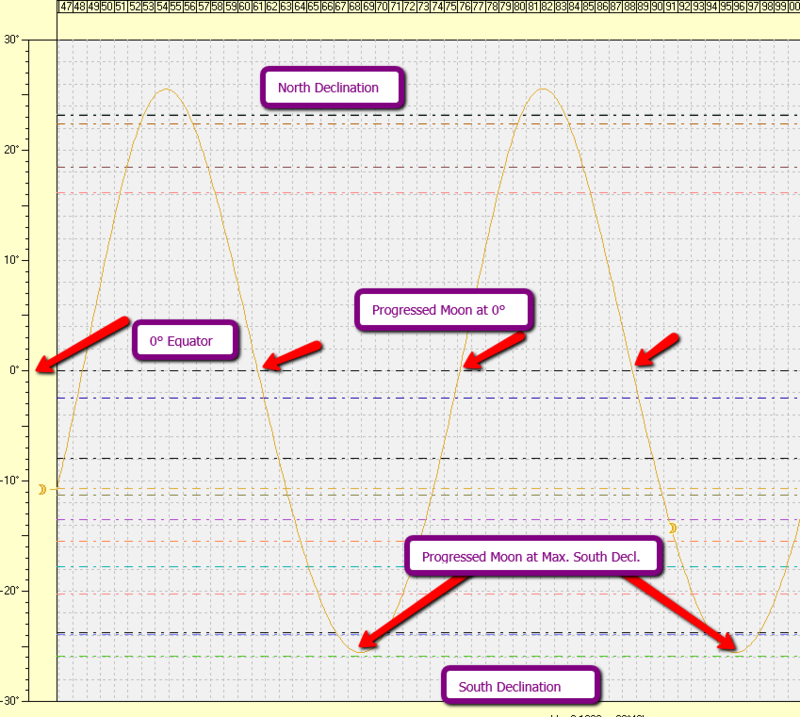 When looking at his direct progressed Moon in declination graph (click here to watch the Graph in another tab), you will be stunned to find out that late December 2013, the progressed Moon in declination crossed the Equator (at 0° declination) denoting a turning point in his life. Another example is Frank Sinatra, who married in February 1939 when the progressed Moon in declination was at its highest declination South. Sarah Ferguson, the British Duchess of York who married Prince Andrew in July 1986, did so when the progressed Moon in declination crossed the Equator at 0° declination. The British soccer player David Beckham, married spice girl Victoria Adams in July 1999 when the progressed Moon in declination was in maximum declination South! Bill Gates, one of the founders of Microsoft Corp. and still one of the richest men in the world, married on January 1, 1994 when the progressed Moon in declination crossed the Equator (0° declination).